My male readers saw this title and thought, “Oh, no, chick talk!” Sorry, guys. To make it up to you, here’s a link to pictures of the 10 greatest moments in the NFL. Anyway, quite a few friends who are pregnant with their first children have been asking me about childbirth, so I thought I’d do a post about it to collect all my thoughts in one place. Here we go! I used to be horrified by the idea of childbirth. In movies and TV shows I’d seen all these depictions of women in labor as screaming, confused and helpless, lying flat on their backs on hospital beds, hooked up to IV tubes, begging their doctors to rescue them from this awful situation. It sounded horrible. Shortly before I became pregnant with my first child, however, I came across writing from people who boldly claimed that birth does not need to be treated as a medical emergency, that it is a perfectly natural process that typically requires little to no medical intervention. They talked about “empowered birth, ” the idea that it’s better for both mom and baby when women take charge of their own childbirth experience. I pored over great books like The Thinking Woman’s Guide to a Better Birth, Ina May’s Guide to Childbirth, Natural Childbirth the Bradley Way and The Sears’ Birth Book and became not only less fearful but hopeful and even a little excited about the idea of giving birth. I became a walking encyclopedia of statistics about hospitals’ disturbingly high rates of cesarean sections, episiotomies, use of forceps, etc., and I shook my head at how often women were encouraged to get epidurals rather than being given the support to work with their bodies to have a natural birth that would leave them free of the risks and side effects that came with epidurals. When I found out I was pregnant with my first child I signed up for a Bradley Method class and made an appointment at the local midwife-staffed birthing center. I was going to have one of these empowered births I’d heard so much about. The birthing center was not in a hospital and had no major medical equipment on-site so going there was basically a homebirth, just at someone else’s home (we lived in a downtown loft that wasn’t exactly the most ideal place for childbirth, otherwise I would have had the baby at my place). When I finally went into labor on a warm September evening, I didn’t have any worries. I’d done so much research on childbirth that I felt like I knew what to expect, and I was happy to be going to the birthing center where the midwives would allow me to be in control of my own birth. Seventeen hours later, however, I didn’t feel quite so confident. It turned out that the baby was compound presentation, meaning his fist was up against the side of his head, which made labor extremely painful and difficult. None of my Bradley techniques for pain management worked, and the last five hours of labor were excruciating beyond description. When my son was finally born I was so exhausted and stressed that I only vaguely remember those first few hours with him. I went home about four hours after he was born, so tired that I was borderline delusional. When I found out I was pregnant with our second child, I planned to go to the birthing center again. None of the hospitals in our city allowed midwives to have hospital privileges at the time, so a midwife birth in a hospital wasn’t an option. Even if it had been, I doubt I would have considered it. I’d unintentionally fallen into a sort of “us vs. them” mentality when it came to childbirth, and, ironically, in my zeal for empowerment I’d limited my own options by developing a very narrow view of what birth should look like. But then, a monkeywrench was thrown into my plans. When I was eight months pregnant I developed a life-threatening blood clot in my right leg called a deep vein thrombosis (DVT). To make matters worse, testing revealed that I have a genetic blood clotting disorder called Factor II which makes pregnancy and birth dangerous for me. Both my midwives and the physician who diagnosed the DVT agreed that I had to have a hospital birth with an obstetrician who specialized in high-risk cases, with additional monitoring by a hematologist. I did my homework on the risks involved and agreed: I’d never be able to have an out-of-hospital birth again. After the first obstetrician’s appointment I found out that labor would have to be induced in order to manage my blood thinning medications, I’d have to be hooked up to an IV, and I would have to wear special circulation-boosting boots that would keep me tethered to the hospital bed. In other words, I’d be the classic “woman strapped down to hospital bed at the mercy of her doctors.” I started sobbing. I was grateful that my daughter would be OK, but felt angry and frustrated that my dreams for having a natural, empowered birth had basically been flushed down the toilet. When the big day rolled around it was all overwhelming — I’d just met this doctor, had never even visited this hospital, and I’d been in too much pain from the DVT to research what to expect from a hospital birth. I felt completely helpless. I ended up getting an epidural at the very end of labor because the nurse seemed to think that I would need it, though looking back I think I could have done without it. The overall experience was fine — the doctor and nurses were friendly, and I was happy that the baby and I made it through safely — and I sadly accepted the idea that all that empowered birth stuff just wasn’t an option for me anymore. Baby number three came along shortly after baby number two, and this time I felt a little more comfortable going to the hospital. I’d gotten to know my doctor better and I knew what to expect this time. I ended up opting to get an epidural, and this time it was without any pressure from anyone. I just wanted it. Once again, in the end I felt that I had missed out on something because it was such a thoroughly “medicalized” birth from beginning to end, and especially because I’d gotten an epidural and therefore given up a lot of control of the process. I had wistful thoughts about being able to go back to the autonomy that came with natural childbirth. I had stopped seeing self-reliance as one of the most important aspects of birth. One of the things that had come of all my research into natural childbirth is that I’d unconsciously developed an assumption that a key aspect of a good birth experience (after the wellbeing of the baby, of course) was self-reliance. With all talk about women trusting their bodies and being fully in control of their own labors, I had unintentionally fallen into the mentality that ceding control of the birth process to medical professionals in anything other than a serious crisis was always a negative, and that medical intervention except in true emergency situations was always a less-than-ideal outcome. None of the books I read or people I talked to explicitly stated that opinion, and it wasn’t something I’d articulated either; rather, it was a vague, unspoken feeling that had developed in the back of my mind after hearing so many stories of women and babies who had bad birth experiences due to unnecessary medical intervention. That has been my experience as well. It’s important to feel empowered, in the sense of not feeling helpless or fearful about childbirth, but don’t make the mistake I did and confuse empowerment with total self-reliance. The truth is that you can’t control your way into a good labor, and making a conscious, educated decision to turn over some control to medical professionals or accept a medical intervention that makes things easier on you is just as empowering as having a great all-natural birth. If I’ve learned one thing from having four babies in five years, it is this: Regardless of how or where you have your baby, a good birth experience is going to involve a lot more trust than control. I’m sure others have some thoughts on this topic as well, so feel free to share. My friends expecting their first babies will be reading and looking for tips! Incredibly well said and summarized in your six points. I'll be sending friends expecting their first children here as well. With my first, I was going to do the whole birth plan thing – music and the whole bit – but 8 weeks into it I got put on bedrest for an incompetent cervix. I kindof forgot the whole birth plan thing while focusing on praying that my baby would live. When it got close to time to have her, it was also getting closer to when my mother needed major heart surgery (a valve repair). The night before I gave birth (having done everything I could try to start labor on my own) I was sobbing to God that I wanted my mom to meet my baby because I was convinced she would die in surgery in 3 days. Two hours later, my water broke and so my mom was able to be there when my daughter was born. At that point, what I wanted/needed was to have a healthy baby and have my mom there (she did survive the surgery and is still around now). With my second I wanted a healthy baby and to have the IV in my left hand (I am right handed, hate needles, and had been in the hospital for several days with an iv to stop labor.) I ended up having an emergency c-section because the little twerp turned around breech 3 days earlier. But I had a healthy baby and I had the IV in the left hand. Thanks for a particularly excellent post Jen. I am 34 weeks pregnant with my first baby (Miriam) and am trained as a midwife. What you were talking about resonated with me a great deal. I've got gestational diabetes and now being on insulin I'm having to relinquish my dreams of a nice natural waterbirth, and wow, does that stuff run deep! You inspired me to post a blogpost I wrote a few weeks ago that I didn't have the courage/humility to post on my thoughts/feelings about this very thing, except from a person who hasn't faced birth herself before. It was great to hear some thoughts from someone who has been there already! You are dead on about not being able to control everything! My first birth started off with my water breaking … in the worst ice storm in recorded history in Oklahoma .. we made it to the hospital ok. but my dr couldnt make it in because of all the ice so i had to use the dr who happened to be in the hospital at the time… well i was induced to start labor- still not dialated or effaced at all! and 12 hours later i was still at a 0. It turns out my daughter was breech. so i ended up having to have a c-section (which turned out to be the best decision) and after my c-section my daughter wouldnt breathe for 9 minutes – and turns out if i would have pushed for a natural birth it probably would have killed my daughter. after that the hospital lost power completely for (2!) days. adn we didnt have power at home either . but i have to say im glad the hospital lost power, there was nothing to distract my family from our duaghter and we just sat around grinning like fools. espcially my husband! My second one was a bit different – it was a planned c-section but that entire last month i was so stressed wondering what was going to happen until i just had to let God take over the rest. 3 months after baby #2 im pregnant with baby #3 and over half way done and praying i dont go into ultra conrol mode- becaue no matter what i plan for , its probably not going to go as i planned. Great post! I have to run out the door but I might be back later with more thoughts. Every time I have been about to give birth–and I've had all but one of mine at home with a midwife–I think of the words of a wise friend: "Beware of Expectation–it is the great joy-killer in life." Although I love my homebirths, I have always kept in mind that the goal of the experience is to end up with a healthy mom and a healthy baby. If that is the goal, it is easier to let go of one's personal preferences and not get too hung up on any personal opinions about what constitutes a "good" birthing experience. This is a fantastic article– it resonates so many of my own feelings around birthing. I am pregnant with my third right now. My first two children were born in the hospital as there are no birthing centers around and my husband was not comfortable with a home birth (and I suppose I was sufficiently uncomfortable with it that I never pushed the issue far). For our first born we sought out a midwife (but I was stuck on the title and never was honest with how I felt with HER personally- which was always oddly cold and a bit uncomfortable). At his birth she was horrible– not at all like I imagined a midwife should or would be at a birth. I was deeply hurt by the interactions with her and it surprised me how long it took to work out inside of me my disappointment and resentment at her actions, words, ect. For my second birth I sought out a PERSON I felt comfortable with, cared for by and confident in. He is an MD and is the most wonderful person I could have imagined to have attending a birth. The process really caused me to consider deeply what I wanted and needed as opposed to trying to fit a philosophy mold about births. Very freeing, joyful…and yes, EMPOWERING! Thanks for bringing this important point to light! Thank you–this is the best birth post I've ever read. I am convinced that different women have different pain levels, and for some of us, the pain of labor can erase the joy of birth. The key, as you and Lisa (commenter above) point out, is feeling comfortable with your choices. My MD is wonderful and did all kinds of "midwife" techniques with me at my births, but with the medical safety net there, which is what made me feel more comfortable. To your pregnant friends: good luck to you, and remember: birth is only the first day of parenting a baby you can see! The goal is to end the day with a healthy baby and healthy mom…however you get there is a good way! We are lucky to live in a country and era with medical interventions when necessary and knowledge of how to have safe, non-medical births…good luck making your decisions about what's best for you and your starting families! Oh my goodness, I feel like your post could have been my story as well. I was horrified by the idea of being immobilized in a bed with tubes and machines and found a midwife who focused on the experience of birth and being "present" and working through pain, etc. Well, about 20 hours into labor and at 7cm with sharp pains down my back it turned out that baby was "sunny side up". Otherwise, face was upward meaning that he wasn't fitting through my pelvis correctly. I was exhausted and contractions were coming hard every 2 min so I couldn't rest. My options were epidural (horror of horrors!) or eventual cesarean. I took the epidural. My chiropractor husband did an adjustment known for turning babies the right way and then I took a nap for three hours to regain strength. Literally I woke up and the nurse checked me and the head was crowning. They rushed out and twenty minutes later I had my boy in my arms. I realized that having that healthy little guy in my arms was the most important thing in the world and the method with which he came out was much less important than I had allowed it to be. With my second, a similar situation occurred but I made my decision to get the epidural much earlier. A nap and about 4 pushes later, my girl arrived. I had to relinquish control both times, which for me is not an easy thing to do. But prayer, breathing, and prioritizing my babies' health over some picture in my mind of how things were "supposed to" go got me through. I hope your pregnant readers will learn from your story and those of your commenters to keep an open mind and heart! As I look forward to the birth of my 4th in a few short weeks (after 2 miscarriages)…I am really hoping to be able to relax some about the whole experience. I won't write my whole story here…too long, but I have had three very different birth stories & I will admit that the "natural one" was my favorite…of course she came after an EXACTLY three hour labor…at the hospital for 14 minutes before she arrived, LOL. PS my word verification in "wamen"
Amen, amen, amen, amen, amen! And amen again! I think "control" when it comes to parenting is almost always an illusion. I think your same points could apply to breasfeeding and sleep training and potty training and a bazillion other things, too. My pregnancies and deliveries were all complicated and the third (born a few days after your Joy) began with my beloved grandmother passing away two hours into it and ended in a C-section. It was a complete lack-of-control situation, but I, too, felt a lot of peace in the midst of it all. Part of it was just that after giving birth twice before, I knew that a lot of it was beyond me. But most of the peace was the belief that, well…most all things are Beyond me. Thanks be to God. You're absolutely right – life doesn't usually work the way we've planned, and we can choose how to react. For example…I've had three children now, and each and every time I have tried my hardest to get a midwife (there are very few up here and huge waiting lists). I've never gotten one. I've then opted to try to do a natural birth. In each and every case, the baby has had a life-threatening issue that necessitated an emergency C-section. At least the doctors said so – perhaps a midwife could have handled it otherwise. I found that I could either feel disappointed and upset that I had to get a C-section (and all the complications that come with them), or be happy that I was blessed with another beautiful baby. All three of my babies have been happy and healthy. A longer hospital stay and a longer recovery don't matter much compared to that. It's so funny – I was just talking about something similar this morning with my husband. We're expecting our first in February, and because we got pregnant 3 weeks after we got married, everything has kind of been a blur. Some people have asked me if I am going to have an epidural, and at first I really wasn't sure. It seemed like it wouldn't be as legitimate if I had one. But this morning I was thinking about it and realized that epidurals aren't bad. Just because women didn't use to have running water doesn't mean I have to use the bathroom outside now. I'm still going to play it by ear when I get there, but I think I'm finally realizing that what matters most to me is that the baby ends up healthy – and, like you said, only God can make that happen. It's a much more content place to be! Great post. I read it this morning at 7. I am 23 weeks along and really interested in what others have to share. I am trying to educate myself; including looking into the Bradley Method bc I want to be educated. I find it interesting when my friends tell me now, "no class is gonna prepare you for birth, just get an epidural" – So your summary points really made me feel better. Thank you! Thank you! Thank you! You have articulated my feelings exactly, although I had not yet been able to identify them. My first birth was a natural, vaginal hospital birth with only a couple "glitches" (IV & a bad tear). My second birth was a planned home birth but ended up being a c-section, because my son was breech. I was devastated by my plan being ripped from me and carried the anger for years. Now, I'm pregnant again, hoping for a VBAC and trying to get a handle on all that involves. Like you said, some of my natural birth preferences are removed in this situation. I have to trust my doctor (I was lucky to find one here that would try VBAC.). Most importantly, I have to trust God. I still believe a natural birth is the best way, but life isn't perfect and neither is birth. The best thing you communicated is that reliance on God will result in the best possible outcome…God's will for you and baby. And, we might just learn some humility in the process! Thanks for taking the time to write this. Jennifer, I read some similar titles before my first child was born. In the end, the visualization that worked best was praying the Rosary, and thinking of Mary. At at certain point, even that didn't work, and prayer was all I had to hang on to. All four births after that were much different. Because I have such a low tolerance for pain, I became very grateful for epidurals, and like you, just thankful my babies came out healthy, though not without a few minor complications during the birthing process. It is freeing to leave some (most) of this process up to our good Lord and Creator! Think of how many women birthed children before any of those books were written. 🙂 But it is good to be informed. I had a very similar experience to yours with my first. I had all my plans ready- from the tub, to the music, to the drug-free labor and delivery- and my doc knew what I wanted. I was emphatic about it. Well he caved and "strongly suggested" (to the point of making me fearful) being induced when my son was 2 weeks beyond his due date. The induction began a long process of being stripped of my wants and desires for the birthing process. Strapped to the bed, constant monitoring, epidural because being induced made the pain unbearable, and 18 hours of labor before a healthy boy was born. With my 2nd, I had a placental abruption and emergency Csection at 25 weeks gestation. Thankfully she is now a healthy 6 year old but that experience forced me to give up control, as my subsequent deliveries all had to be Csections and I am no longer able to carry a baby due to the weakness of my uterus. Trying to maintain a white-knuckle grip on control for something so OUT of our control is detrimental to the process. My 3rd and 4th experiences (scheduled Csections) were wonderful because I had released my own expectations of myself. Great post!! I am neither solely in the natural birth camp or the mainstream medical camp. I see the potential benefits of each. My children's births have gone across the spectrum of almost completely nurse and doctor driven to almost completely uninterrupted. The only thing that is a sure thing when it come to childbirth is that no two births are the same. Each child's entrance and each mother's experience will be different and varied. My only advice is that God would guide and direct you for what THIS birth and THIS experience will uniquely bring, and that His best for you and His power over it will be poignantly felt. Thank you for your post! It makes a lot of sense. Both of my sons were born at home with midwives in attendance, and both required transfers to the NICU a few hours later due to breathing issues. I'm hoping to be pregnant again soon and I'm plagued by indecision over who I'd go to for care in a third pregnancy. In my head, hospital=scary interventions but avoiding a transfer would be make a much less stressful postpartum. On Friday, I attended my SIL's first birth, a home waterbirth that went perfectly despite her assumption that something would go wrong. Excellent post. You've summed up my feelings about birth exactly. What a great post – and as someone who is terrified of having children – from being pregnant to raising toddlers to dealing with teenagers, all of it – you did a great job of sharing enough info w/o freaking me out (hard to do). Should I ever be pregnant, I will definitely check out some of the books you mentioned! There's so much pressure on the "right" way to give birth (and ten million versions of what "right" means), and it's so sad to see women unhappy because of it. I've always felt that ending up with a baby on the outside instead of the inside, and both Mom and baby safe and more or less healthy means you did it absolutely right. Thanks for reminding us all of the power of expectations and control. Very good lessons in this post, but there is one little thing to quibble about . . . It's important to feel empowered, in the sense of not feeling helpless or fearful about childbirth, but don't make the mistake I did and confuse empowerment with total self-reliance. "Empowerment" is all about total self-reliance. Empowerment is all about control. The idea of empowerment was the hook used in the Garden, and we see where that got us. One of the lessons of this story is not to change one's idea of the word of "empowerment," but to reject it altogether. Words mean things. What is described as the lesson learned, dubbed "real empowerment," is not empowerment at all, but is instead "freedom," authentic freedom. Authentic freedom is necessarily grounded in truth ("the truth will set you free"), including the truth of our own limitations, as well as the truth that the human person is a social being made for love. Love not only means placing yourself in the trust of others, including the Other, but authentic love is truly transformative. It is love that has the true "power." The transformative power of love can change meaningless suffering to a kind of joy, it can even change death to life. But we are "empowered" in this way only by giving up thoughts of power. Rather, it is in the authentic freedom of truth and love that brings relief and comfort and joy. I'm due with #1 in one week and am very grateful for everyone's stories here. Nothing in my life has been under my control thus far…why would I expect birthing to be any different? Hoping to go all natural, but glad to have modern medicine on my side if something goes wrong. While I certainly don't have any room to talk, since I haven't put myself in the path of maternity, I have an opinion. Yes, women have been having children for thousands and thousands of years and lived. On the other hand, children are getting bigger (which the woman's body is not always prepared for), and women have been dying of childbirth complications for thousands and thousands of years as well. While I put child birth decisions in the hands of the mother, I always want her to know that a medical birth isn't a failure. If my mom hadn't been in a hospital when she had me, I would have killed her and myself – I was breach. The reality of the situation is that medicalizing childbirth has had its benefits – namely, that more mothers and infants live. So pregnant women should know what their body is telling them – if it's telling them that it is too dangerous for them to do a home birth, then don't feel ashamed for not dying for your cause. And if you want a medicalized birth just because you want to, feel free. No reason not to want to put yourself in doctors' hands. Raising children is hard enough without worrying about the childbirth part. Some very good insights in your post, Jen. When I was pregnant with my son, I was pretty sure I wanted a hospital birth and did a lot of research on OBs and hospitals. The only thing I was certain about was that I did not want a c-section if at all possible, emergency option only. I don't recover well from surgeries and it takes me twice as long to heal from wounds as most normal people. My OB ended up inducing me at 8pm on my due date because of my elevated and rising blood pressure. The next morning at 8am I received my epidural and was happily pain free for the next 8 hours. I never really experienced any painful contractions because of this. At 4pm I began pushing and kept at it until he was born 4 1/2 hrs later. It turns out he was sunny-side up. To make matters worse he has a huge head and had to be pulled out by forceps because he just didn't want to come out. After he was born, he fell asleep almost immediately. So all in all, it wasn't some spectacular experience. I didn't have any major expectations except for my desire to avoid major surgery, so I look back on the whole experience with peace knowing that I did what was best for me and my son, and he is perfectly healthy with no problems resulting from his birth. He didn't even have a pointy head, it went back into shape almost immediately after birth. I just hope future kids aren't as…lazy. I think it might have been nice to be able to walk around and would prefer to actually experience labor once. I hear what you are saying.However, I would never consider not giving birth in the hospital without the neonatal unit. I have had four c-sections. The first two c-sections were not planned. I am so glad for the technnology and expertise of the medical staff. At our hopspital they have an alternative birthing room that simulates a homelike environment and midwives can help out. BUt I have to say again I would never consider not giving birth near the advanced medical equipment and specialists that in a split second can help to save a baby indistress if need be. Great post, Jennifer! For me natural childbirth in a birthing center (like the one you described) was a decision made more out of fear than attempts of empowerment. I'm scared of hospitals, and I'm not totally sure why. (I think because as a child I frequently visited my grandfather in the hospital as he was dying.) I picked my birthing center so my husband could be in the bed with me while I was giving birth. There were queen sized beds there, and I thought to myself, "He helped this baby get inside me, so he's helping me get her out!" It was a wonderful birthing experience, with no IVs (I also hate needles), complete mobility, and a birthing pool. I prayed the Jesus Prayer to help with labor pains and just surrendered to the process. DH and I even fell asleep when I was 8 and 9 cm dialated, waking up when it was time to push. I only read one book on natural childbirth (Active Birth by Janet Balaskas) and never took a class. I think patience and prayer helped me most. Very well put. Thank you so much for posting this. I admit that I am an idealist when it comes to this experience which I have yet to experience but so badly want to. It's become a dream in my head and my heart, and I know that I will have to remember the last two points especially. When I was pregnant with my first child, my ob and I had a discussion about pain management and my birth plan. I was opting not to have any medication at all (which he was totally fine with) and then he made a statement that resounded with me for my entire pregnancy: "It's fine to make a plan and I'll support every choice you make. But just remember: that things change fast and, if you make different choices on the day of, or if I push for intervention because of what I see, you are not a failure as a mother or as a woman. No matter what happens." He would continually restate that throughout my totally normal pregnancy. And then, I went into labor on the 4th of July and everything went totally haywire with my body. I ended up having an emergency c-section under general anesthesia without my ob attending. Afterwards, a lot of my female friends asked what I was thinking, how I was feeling…and all I can tell them is that there was this overwhelming sense of peace, this knowledge that no matter what happened I could trust God with both my life and that of my daughter, and that I had not failed Him. I have never once felt that the birth of my first daughter was anything less than "empowered" despite the fact that it was totally different from my plans. Now, 39 weeks pregnant with my second child, I find myself in the same place. I've made my desires clear about my initial choices concerning the birth (we're trying for a VBAC), but I'm in the same place: "God, I'm in Your hands and I trust You no matter how the day ultimately goes. My daughter and I are yours." Thanks for this post. My first child ended up a cesarean and so the other three children were also delivered by cesarean as will my fifth be. This form of birth is humbling and really takes all of the control out of my hands. I've even had a couple of people tell me, "that's the easy way out," without consideration for how I felt about it or whether or not it was/is truly easy. I've struggled with it for many years (why couldn't my body do that one thing?) and finally came to the realization that I was just plain blessed to be able to easily conceive and carry children to begin with. So method of delivery is my little cross to bear. But the greatest reward comes from it; a healthy, bawling baby for which I am eternally grateful. Interesting post. I agree with the poster above about finding a care provider you're comfortable with. I had a clinic birth overseas and a home birth in the U.S., and much to my surprise was happier with many aspects of the clinic birth – I think because my doctor there was just so good. I'm so glad to have read this. Thanks for sharing your perspective, I'm going to bookmark this to come back to as I consider what to do about my 3rd birth. This post came at just the right time! I'm just 6 and a half weeks pregnant with my first baby, and I've already come up with all these expectations of what I want and what is the "right" kind of childbirth experience. Thank you for reminding me very early on that I can't control everything – nor would I want to. I am pregnant with my third, and when looking back on my first, I had an epideral and (this feels slightly weird to say) but I mourned not experiencing feeling pushing him out. Because I didn't feel pushing him out I had this disconnect in my head between when he was inside of me and now him being in my arms. It was like something was missing. Not to mention I was completely out of it afterwards. My second birth I did naturally and what a difference. I LOVED the experience of feeling all the sensations of bringing her into the world. And I was so with it afterwards that I could enjoy the moment so much more. As I said, no judgment, people do what they need to do at the time for what is best for them. But just something to keep in mind when considering all the options. I think there are too many women on the natural side of the birthing fence that do see a "overly medical birth" as a personal failure. And I think that is sad. At the same time, there are too many women who have planned C-sections because they don't want birth to screw up their plans too much. So, I think the control issue runs both ways. I don't think that natural birthing philosophy lends itself to thinking we can be in control. In fact, it seems to suppose the opposite. So far as I can tell, natural birthing philosophy says that you should trust your body and trust nature. To me, that is a form of giving up control, and trusting that the natural process will play out successfully, no matter how it plays out (whether you have a 14 hour birth or a 34 hour birth). And most importantly, natural birthing philosophy tells you that pain is OK. For Catholics, I think this is the key issue. We believe that suffering is redemptive; it is a form of purification. And as mothers, we are called to unite our own sufferings (in labor too!) with Christ's suffering on the cross. I think most women forget about that aspect of birth experience; but I also think it is the most important. Interesting that you equated self reliance with the idea of trusting your body. In my experience, even in natural births, the more I am able to surrender and relinquish control the better labor goes. It has to do with trusting my body to do what it's supposed to do, what God made it to do, and letting my body think and move on it's own for a while. Birth, however it happens, is always a form of surrender in the end. It's NEVER like anyone else's. I wish I had prepared as much for what happens AFTER birth as I did for the birth itself. What a gift it is to be able to imitate Our Lord and say, "This is my body, given up for you…"
I wanted a Bradley Birth with my first. And we did the classes and felt prepared. And then found out he was a footling breech at 30 weeks. Had the C scheduled. Tried EVERYTHING to get him to turn. No luck. The experience of the surgery was just fine, and I had a great surgeon and it was very uncomplicated. But I still felt like something had been stripped from me. Tried for a VBAC with No. 2 with a VERY friendly doc. But 25 hours after my water had broken, I was still -2 and only 4 cm. So, C no. 2. Turns out it was another malposition. It is very hard, when you have an idea of what you want, to have that taken away. It really IS all about expectations. Although there is part of me that still "regret" that I didn't have a natural (or even vaginal) birth, I recognize that God is the only one in control. However, if I have to give advice to a first time mom, it would be to become as educated as possible about birth and the choices you have. When we had our third child my OB said to me, "You don't get extra points in Motherhood or Life for trying to gutt it out." It was exactly what I needed to hear. I quit feeling guilty about the epidural and instead focussed on the moment. Six children later, and four c-sections, it is still the best piece of advise I have ever received on labor and delivery. I love, love, love this post. Remembering who's really in control – that's where it's at! God is good. He carried us so sweetly. He proved Himself to us to an extent that our "faithfulness" hadn't warranted. And He has healed my heart so beautifully that I can praise Him for the life of my daughter, just as it was. And, in regards to your article here – I was able to walk into the births of my son and second daughter with a whole different sort of empowerment. I knew that, no matter what, God was in control and was working all things to the good of those that love Him. No matter what. Due to the medical circumstances of my first, all three of my kids were born cesarean. I only labored a short time with my first, only had a few minor contractions with the second, and never started labor with the third. And then, with massive amounts of prayer and spiritual guidance, we found ourselves coming to the previously undreamed of reality of not growing our family by way of additional pregnancies. Because! – through all this God lined up everything perfectly for us to be going to our fost/adopt orientation this coming weekend. It had long been on my heart but I really didn't have a vision for how we'd fit it in… but God knew the bigger picture. God radically challenged everything I ever thought I was sure of in regards to pregnancy, birth, and "family planning" – and I am closer to Him for it. It is so important for mothers–who are surrounded by so many "shoulds"–to remember to trust their instincts and God when it comes to decisions about birth, to rely on God when things are not in their control, AND to be gentle with themselves and each other when things don't go as planned. What a wonderful reminder and affirmation for mothers and mothers-to-be! I do think it's important to keep in mind that trusting a doctor (or midwife) is not necessarily the same thing as trusting God, and that women who end up choosing/needing interventions aren't necessarily more faithful or trusting than women who don't. I feel very blessed to have had two very wonderful, very different natural births at home. My first daughter took three days to be born (posterior presentation), and without my husband's support and my midwife's expertise, I never could have done it. My second daughter came before the midwife did, and my husband caught her! 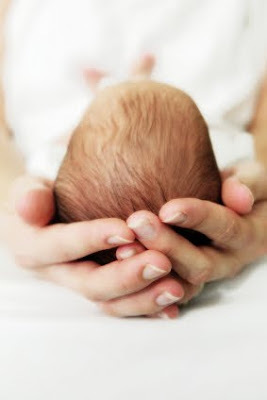 I relied on him so much–I was pretty scared, and he was the one on the phone with the midwife! I never saw my decision to birth at home as an attempt to "control" birth (and trust me, I was NOT in control! ), but rather to manage and prepare for what I reasonably could so that when it came time to release control–as we all must in birth–I was in what I considered to be as positive a situation as possible. Many of us who prepare for and hope for natural birth are looking forward to an experience of waiting for the body's natural processes to unfold, trusting God and those around us, and letting go–sort of the opposite of being self-reliant individualists or being controlling, as we are sometimes portrayed. Also, we are not prioritizing an ethos over our baby's health–we believe that we ARE making the best choices available to us to have a "healthy mom, healthy baby" because that is absolutely what matters most to us, too. I wish nothing but comfort and acceptance for all moms who have gone through the passage of giving birth. I hope that women who have birth plans or hope for/have natural birth don't need be portrayed in a negative light for other moms to feel at peace with their birth choices or events beyond their control. Hi Jen, Thank you for this post. I have 3 children and what I wonder is: Since when did Doctors and Western Medicine become the enemy? I noticed this in my reading with each pregnancy. After the birth of my first child I realized how influenced I was by the trend of suspect your Dr. I came to have respect for the training and expertise of the medical professionals and yes, humility before God, that He would allow me to participate in this grand pageant in such an intimate way. Thank you and God Bless! As a former doula, I'd have so much to say if I had time! Great post! The idea of "control" in birth is such an interesting and layered concept. Ultimately, both giving birth and coping with labor are about LETTING GO and giving in completely to the process, trusting your body, trusting God, and trusting those you are with. But control of your care is a complex matter that involves controlling your controllable choices, including the choice to trust a caregiver when appropriate. Having a great birth is not about choosing specific things or having a specific, ideal outcome, it's about the process, and how you participate, and most importantly (research shows), how you are treated during the process– with respect, dignity, sincere care, etc. When it comes to care, there's a huge difference between, just ceding control or having it taken from you in a disrespectful way from the beginning and doing it as a choice. I always told my clients to prepare as well as possible and do everything they could to set things up for the things that were important to them in their vision of a great birth. Then, just keep doing the "next best thing" at every juncture (small or large). If you get to juncture A and choose the best thing for you at that point, and get to juncture B and choose the best thing for yourself at that point, and so on, even if your endpoint is an emergency cesarean, it will feel *entirely* different than if you'd arrived at the same less-than-you'd-hoped-for endpoint saying, "What the heck just happened to me? And how did I get here?" The latter scenario can have some terrible emotional/psychological ramifications, as birth is a very vulnerable time. The former scenario, while not having the most ideal outcome you might have envisioned, allows you to know that you had the BEST birth possible in the circumstances you had, and that you made good choices for yourself in the process. A skewed view says, "My ideal experience and outcome is THIS, and if something goes awry from that path, then, oh well, it's all out the window,everything just happens TO me now, and it's a "bad" birth experience!! I've personally seen the same births (same in terms of setting, interventions, and outcome)with entirely different outcomes emotionally for the mom, and this respectful care and degree of participation were the difference. A good doula recognizes that it's about the woman, her emotional experience, and what's important to HER, and she gently fosters and guards that. my advice to new moms is to educate yourself: know why you're choosing the options you're choosing as well as under what circumstances you would make a different decision. my experience is that birth never is exactly how your would imagine it. our second (only 10-weeks-old), was almost born unassisted as we beat our midwife to the birth center and the babe was passed crowning. she was born on the porch, less than two minutes after the midwife arrived — not was i had planned, but we were both healthy! Bravo, Jen–one of the most sensible things I've read in ages. While I do understand the reasoning behind the natural birth movement, I don't like the "us vs. them" mentality that often springs out of it. I can't help but wince a little when I hear a pregnant mom make proclamations about what her experience will and won't be–after having birthed two preemies, I know firsthand how often the birth experience hands us a heaping helping of UNexpectedness! Your post is a good reminder that we'd all do well to approach everything in life (not just birth) with a hefty dose of common sense, humility and flexibilty. I would like to add that it's better for mom and baby, and dad too! It was super awesome to see my husband listen to what I had learned about natural birthing and then step up to be my coach and learn about the stages of delivery, help me do my relaxation excercizes, etc. I'm heading in next week for c-section #3, and to be honest, I'm so comfortable with the process now that it's just become routine for me. My first son was over 2 weeks overdue, and as such, he was HUGE. I was sent to the hospital on a Tuesday night to be induced the following morning, and as it turned out, went into labor over night. I labored for 26 hours before my Dr. informed me that I just wasn't progressing, that I was starting to suffer, and so was the baby. Mostly, I was RELIEVED that it was all going to come to an end. Even the epidural wasn't helping with the pain and I was so exhausted. A tiny part of me felt that I had failed at the whole childbirth thing…but the relief of being almost done was stronger than that feeling of failure. As it turned out, my boy was 10lbs, 6oz. And I had stopped progressing at 6cm. Not a good combination. At the beginning of pregnancy #2, my husband and I discussed the option of a VBAC. We agreed that the c-section had been so easy for me to handle that if the Dr. recommended going with a 2nd surgery, we'd be okay with that. (Plus we trust our Dr. and weren't concerned about him talking me into an unnecessary surgery.) When we brought it up with him, he told me that his honest opinion was that I was not a good candidate for a vbac…that "history" had shown that I have big babies and a small frame and chances are we'd end up in the same situation anyway. I have to say – going to the hospital KNOWING that you won't be laboring and pushing is quite an experience….and recovering from a c-section that is planned vs. recovering from a c-section after 26 hrs of labor is SO DIFFERENT! I agree with those who say to educate yourself. Arm yourself with as much info as possible and make yourself a good birth plan that you will go over with your husband and your doctor….and the nurses who get you set up once you get to the hospital. But most of all, remember that childbirth is full of surprises. If you can train yourself ahead of time to be flexible then maybe it will be easier to not be so hard on yourself in the event that you have to change course mid-stream. The most important thing is that healthy baby…the rest is just details. The sign of your "success" is holding that child in your arms, regardless of how it got there. Jen, thanks for this post! I am pregnant with my first (very similar to Chelsey above, we got pregnant 4 weeks after the wedding and it's been a whirlwind!) and your reflections as well as everyone's comments have been very comforting. I started from the beginning, on my own but also under the advice of my mother, saying "Well, I hope to have a natural birth, but things happen and if I can't have what I planned, there's no reason to freak out." As many have said, if we end up with a healthy baby and healthy mom, it went fine. Also, I don't know how I could do this without God- I converted to Catholicism this year after being a "casual" Protestant, and without my daily prayer and God to turn to, this would be difficult instead of beautiful for me. This is one of the best posts on childbirth I have ever read. I did not have a traditional "empowered birth" but I have always thought very positively of my two caesareans. Both resulted in a healthy baby which was empowering. Thank you for this post! I am 34 weeks pregnant with my first baby. I was hoping for a natural birth, read all the books, memorized all the statistics, and was pretty against all interventions. I'd started to see my doctor more as my adversary than my advocate. But, I recently found out that I have pregnancy induced hypertension that is likely to progress to pre-eclampsia in the coming weeks. Since this is a bad situation for me and the baby, it's likely that I'll need an induction, epidural, IV, and maybe a cesarean. I was so upset when I heard this, but reading this post really helped. Thank you! Medical knowledge is a gift, and I am grateful for the science of c-sections; but, since both of my children were c-sections (emergency, just at the last minute surgeries because both boys turned), I sincerely regret it. I think a vaginal birth is much better and healthier for both mother and child. All I can think is that God wants me to carry this emotional cross (it makes me very sad), because had I the real option, I would have done vaginal births for both. Here in Ottawa, Canada, anyways, there's pressure to have babies quickly, and too often the doctors press for c-sections after a couple of hours. When I was in the ward, of 10 women, I was the only one *without* a schedule c-section. As a physician who loves to deliver babies (and who is also pregnant with my first baby!) I really appreciated this post. I do think that lots of women have this "anti-doctor" feeling. Part of me can understand the roots of this – doctors treating women poorly, aggressively pushing for interventions that can lead to complications, women feeling rushed, etc. At the same time, though, women should know that there are lots of doctors out there (like me) who love encouraging women to have as natural a childbirth as they desire. So people should definitely shop around and make sure their doctor is someone they can get along with. But it is also good to remember that the ultimate goal is a healthy baby, and sometimes emergencies happen and things don't go as well as hoped – and doctors do want to make sure that everyone stays healthy. Personally, although I know the research that shows that home birth and/or birthing center birth as just as safe as hospital birth, I will definitely be giving birth at the hospital. I've seen myself plenty of unexpected problems that come up both with babies and moms after delivery. While I do trust in God to keep me safe during our delivery, I also want to be prepared with the resources available. Jenifer, so sorry to hear about your difficulties and loss of being able to have "natural births." You certainly made some good points about needing to trust and let go of control. However, I hope people will really take to heart your points on educating themselves and finding a dr/midwife worthy of trust because many are not. The maternity care system in the US needs major changes as is made clear in the books mentioned (read them ladies; they're a great start to educating yourself! )Be careful of your choice; some drs will say "you must do x for the health and safety of your baby" when x isn't necessarily needed, but what mother could refuse when a dr says that? Another point I'd like to make is this: our culture promotes too much "dependence" on the medical profession and an inability to handle pain. Catholics understand that suffering can have a purpose. Just because you have an epidural doesn't make you a bad mom, but they DO have negative effects on babies so know what you're saying yes to and don't get one carelessly. As mothers, we're called to sacrifice for our children and it starts during labor (ok pregnancy too). Stay strong, unite your suffering to Jesus. It is possible – and if you can do it God rewards you with your own body's massive release of endorphins that give BOTH mother and baby a euphoric sense of happiness and well-being postbirth (and even during help mom and baby cope with the stress and pain. The real reason Natural Birth is good is that that is the way God made it and to interfere unnecessarily causes a whole cascade of potential problems. Ladies, I do NOT wish to make anyone feel bad about having had a less than perfectly natural birth. I have nothing but sympathy for all the difficult siturations many of you have found yourselves in and admiration for how you've come to terms with them. On a happy note, those happy beautiful natural birth stories where nothing goes wrong are real too! My second was born at home so quickly that the midwife didn't make it in time (the first was a hospital birth). I was and am greatly thankful to God for that birth. I think it's important for pregnant women to hear these happy stories to help them be less fearful of birth in a society that tells us that birth is "scary." Of course, there's no telling what any given birth will be like: the one predictable thing about birth is that it is unpredictable. But we do need to find a balance. It's so hard to let go enough, to trust and accept things that are beyond your control and yet also stay "empowered" enough to fight for what you can legitimately have (like an unmedicated birth when there aren't any major complications). Thank you for writing this post, Jen. I really needed to hear this. I'll be delivering my baby #3 in a little over a month at a birth center and those old fears still creep in when I think about birth–the pain, the lack of control, the what-ifs. God's running the show, and his plan is always better than mine. Thank you for your beautiful words of wisdom (as always!) I am not only a new Catholic, I am also a Student Nurse-Midwife. I came to midwifery after the birth of my daughter and felt it to be a calling. I hope to one day open a birth center in my town and offer women the opportunity to have the magical birth experience that everyone deserves! Thanks so much for bringing something so important out into the spotlight!! Have you seen 'The Business of Being Born', a documentary by Ricki Lake and Abby Epstein? Marvelous job of showing how medicalized the birth process can be in the US. It's available on Netflix if you haven't seen it yet–I can't recommend it enough for any woman who cares about birth in America! There is truth in what you say, and yet I have to disagree to a fairly large degree….say somewhere between 65 and 75% . Now no one is completely in charge of the progress of her own labor. But one certainly can be in control of whether and where, she walks, sits, lies down, stands, or squats, and of whether and what she eats or drinks, and of when she holds her baby and when she puts it down. She can be in charge of who is present and who is not present during her labor and birth. All of these things were important to me. For me, starting with a C section and feeling that my body failed me…which it didn't; it was entirely iatrogenic…it was a triumph to get to a point where I knew I could give birth, myself, in my own house, with no drugs, no IV, no monitor, no medical trappings at all. I am grateful however for one product of modern medicine… the rho gam shot, without which I could not have had nine children. I am grateful for the doctor who assisted me to have the births I wanted, although he was not present at them, who helped me research various issues, and who took the time to take my saved cord blood to the lab for a crossmatch and come back to my house with my rho-gam shot. If you really have a medical issue and need medical assistance, well then you do, and obviously there are way more important things in life and an attitude of realism and acceptance is the only rational one. However the C section rate in this country is over 25% and in some places it is closer to 35%. A fourth to a third of women can't safely deliver their babies vaginally? This is preposterous! It used to be that a doctor or hospital that had a greater than 5% C section rate would be investigated! The "natural" C section rate is about 5-8%. So while any particular woman's C section may have been medically necessary, MOST C sections are not. I remember the OB who was partner of the OB who delivered my second and third , saying to me that he had just been to a conference out west, and they were talking about delivering all breech babies by C section. I've delivered hundreds of breech babies vaginally, he said, and I never heard that there was anything wrong with a single one of them. This was an older doctor and the year was 1974. He told me that they aren't teaching the younger OB's how to deliver breech babies any more and that it was a great shame, the art would die out. What the medical establishment is doing at any particular period of time isn't necessarily the best thing. Sometimes they improve in one way…like letting fathers in, but get worse in others…like doing too many C sections. So if you are someone who goes into birth really caring about the kind of birth you have, a childbirth class and a couple of books don't give you enough knowledge to decide what to ask for, what to demand, what to refuse, and what to accept. I observe that not everyone cares about this, and I can't insist that everyone be me and care about what i cared about. But for those who do care, all I can say is, learn everything you can. If you can be at a home birth, especially one of a confident mother of several children, that will help you believe deep down that babies do come out and don't need to be taken out, and that women can handle the pain of childbirth. Women used to learn from seeing their mothers and friends give birth, but this is rare now. So yes, things don't always go according to hopes and expectation. I just wouldn't want that truth to become an excuse for accepting medicalized childbirth whole hog without questioning a thing. I hope the whole giving birth thing is a little ways off for me yet (as I'm very much unmarried), but your thoughts on the emphasis on control particularly caught my attention. Up here in Canada, euthanasia is a hot topic at the moment, and phrases like "dying with dignity" contrast sharply with my conception of human dignity. I was reading an article* where the author commented that often in discourse over euthanasia, "dignity" is used to mean having complete autonomy… which reminded me of your post, of course 🙂 It seems that the over-emphasis on independence and control is not issue-specific, but rather a more broad reflection of primary values in society today. Of course, this shouldn't be particularly surprising given our cultures focus on "choice," even when it trumps life. I'm sorry if I'm repeating others' comments, but the absolute best advice I got before I gave birth the first time is similar to your advice. Research, know what you want, but mentally prepare for some version of a worst case scenario. Although my births were pretty textbook I had thought through many other things and it really helped me to 'let go' and let God, the nurses, and doctors do their thing. "A fourth to a third of women can't safely deliver their babies vaginally? This is preposterous! " First, that happens because of CYA medicine; in this litigious society, juries overwhelmingly side against the doctors, even though nothing medically wrong happened. It's just too "mean" not to give a disabled child some money (money which is much harder to award when a medical intervention – like a c-section – was done). And that, in turn, make medical malpractice rates skyrocket, which is why there is such a shortage of ob's in many areas these days. Not worth it. Also the idea that you "learn everything you can" is much less than you think it is. We all can't be midwives, never mind MDs. You have to learn as much as you want to, as much as you feel comfortable doing and then you have to trust. Which is the point of this post, I think. And I do think the pendulum has swung too far in the other direction: No one goes into childbirth without doing research these days. No one accepts all MD opinions without questions. And the most important thing is: no one is forced to do anything they don't want to do. Going to a dr or hospital or midwife or birth center is 100% your choice. One thing not mentioned is the infant and maternal mortality rates of pre-hospitalization years. Women and babies used to drop like flies – it was extremely common – and had I not had my first in a hospital, i'd be dead and my child would have been severely handicapped. He's in med school and I'm still kicking. I am also not one to get sad, sentimental or anything else about the kind of birth I'm "supposed" to have. I know that the very idea that I exist here and now, in this society, with these marvelous things like anesthesia and infection-fighting drugs and the brilliant minds who discovered them make me very happy. Please keep in mind that if you have anti-contemporary medicine biases, remember: it's all your choice. Dr's just don't need suspicious patients; it's not conducive to a trusting relationship. What a beautifully written account of your birth experiences and wise advice. No woman can control how labor or birth will proceed. When I had my children (years ago) both were presented in a posterior breach position. My grand plans of home birth for the first and VBAC for the second proved moot. Trusting in the experience of those more knowledgeable than I proved to be the best course of action. I think in general most books and "experts" on "natural" childbirth have a lot of misinformation concerning medical interventions. I love the idea of natural childbirth but it sets most of us up for unrealistic expectations and puts a lot of stress on women to do birth "right" as previous commenters have pointed out. I am an example of something that can go horribly wrong without anyone being aware of it. I started getting sick (respiratory) at 36 weeks with my first child. After an antibiotic, I was doing worse and I knew something was wrong but the doctors wouldn't listen to me. FINALLY, a doctor agreed to run blood work. I gave birth before the blood work was back the next day. I had fatty liver disease due to pregnancy and no one realized anything was wrong until two things happened: my blood was not clotting well after an extremely fast (two pushes) vaginal birth and the 1/2 dose of Stadol I received less than an hour before birth almost put me into a coma (it is metabolized through the liver and mine was not functioning). Forget about making sure the birth, etc. was perfect! I son't remember the first 2 1/2 days of my older son's life! I, too, would have been dead had I been anywhere other than a hospital. Fast forward more than seven years and the birth of my second son. I didn't even make a plan. i just knew that I wanted my baby to be healthy. I was induced due to blood pressure issues, and I gave birth quickly (long story though) and without any meds. It was wonderful to actually have full memories of before, during and after the birth! Now, I have had many friends (especially with their first child) that have beaten themselves up because things didn't go according to 'plan', i.e., c-section, epidural, or whatever. As if it was their own fault! I have been reminded over and over again that childbirth is a miracle – and that there is always a chance, however small, that something can go horribly wrong (hospital or not, plan or not). Add me to the list of people who wanted to go au natural, but ended up doing otherwise. Baby didn't want to exit the womb; two weeks past my due date we did a Cervadil induction, and things went great for ten hours of drug-free labor…and then stopped. In the long run, I ended up with a C section. But I was OK with it, because I got to make the choices all the way through. And then it turned out that Alex was a monster at 10 lb. 6 oz, with a head that…well, let's just say if it weren't for modern medicine, neither of us would have survived labor. All is as it should be. Love your thoughts. Oh my gosh Jen! I read this post and it was a little eerie how similar some things you said about your first birth experience were to my own. We went to bradley classes and I was set on having a "natural" birth although I already knew I had to have it in the hospital. I have a Factor VII BLEEDING disorder (opposite of clotting) that put me at a very high risk for hemorrhage. I couldn't have a midwife because I was too high risk. Anyway my pregnancy was already compounded by a large tumor on my placenta that put the baby at risk for problems and to top it off I became preeclamptic and had to be induced a month early. I had the IV, the 24 hour monitor, cervadil, and pitocin. My labor was somewhere around 50 hours and I only got about 2 hours of sleep in the 3 days before we had her. The only way we could have been farther from our birth plan was if I had gotten an epidural and a C-section. The thing that helped me the most was knowing the process of labor (thanks to the bradley classes), lots of practice with relaxation techniques, and holding on to my one last request on my birth plan which was no drugs for pain (I hate the way they make me feel anyway). As an aside epidurals are apparently dangerous for me since I could bleed into my spinal column and become paralyzed according to my hematologist. I guess looking back it was kind of traumatic but after it was all over (and I had a week or two to recover) I had the sense of accomplishing something, the baby and I made it out ok and healthy and that was really the most important thing, not whether or not I gave birth in a tub or without an IV. Bradley classes are good but I sort of got the sense from them that if you didn't have a "no intervention" style of birth that you somehow were weak or lacking in some way. I think it is important for women to realize that we don't have control and we shouldn't get too hung up on the details. I teach the Bradley Method of Natural Childbirth and tell my students that the hardest part of labor is letting go and giving up control. Trying to stay in control is what makes labor so painful. Bradley is also called Husband-Coached Childbirth. The mom lets go and not only trusts God's process but also trusts that she has a loving husband who is educated and there to protect her so she is able to be vulnerable. It really is such a beautiful process. I relate everything that I have learned from my 4 Bradley births (2 at hospitals, 2 at home) to other aspects of my life! Thank you, thank you, thank you! Although I was not as "extreme" as you in my thoughts on avoiding hospitals, I was dead set on having a natural drug free childbirth with my first child. Our hospital has midwives on staff and the OB's are there in case things go wrong. I thought this would be a nice safe guard that I wouldn't need but the security made me feel a little better. My pregnancy went great but at 42 weeks we finally made the decision to be induced, when I arrived at the hospital my blood pressure was elevated and never came back down. I was transfered to an OB, ended up stuck in bed, receiving medicine that made me unable to move around (although preventing a seizure), ended up getting an epidural some time around the 20 hour mark, pushed for 3+ hours and finally had a c-section. Everything went wrong, I did not have a single thing in my birth plan happen (expect the most important – healthy baby). I ended up being extremely disappointed, felt like my body had failed me, and was very depressed that my "womanhood" had failed. With my second I hoped against all hope and prayed a lot that I would be able to have a sucessful VBAC with the help of our midwives, but in the back of my head I was always a little unsure that it would happen. I tried so hard to trust God, but in the back of my mind and sometimes the front I didn't really have faith. I just assumed my body would "fail" me once again. But I wanted a natural vaginal birth more than anything else (except a healthy baby). On Wednesday morning (this very wednesday) I gave birth, vaginally, and naturally to a healthy baby girl. All my prayers were answered and even one I didn't (a very unexpected 7 hour labor)! Your thoughts are needed for all woman to be reminded that God is ultimately in control – and that He often uses the resources at hand (like medical intervention). While our bodies are meant to do this, before medical information many women and children died in childbirth – I would have likely been one of those women were it not for medical intervention. But God is also good, and this time around He answered all my prayers and I could not be more grateful for my two wonderful children and the stories that brought them to me. Thanks for your great perspective– I sometimes feel like discussions about birth really do become an "us v. them" kind of thing because we get so stuck on the best method, rather than having a God-honoring attitude. Whom are we seeking to please with our birth choices or our reaction when we no longer have the power to make those decisions? I really want to underscore your recommendation to find a practitioner you can trust, if multiple options available to you. Shop around for your midwife or OB until you find one you REALLY feel comfortable with– and it isn't too late to switch later in the pregnancy! Of course, that practitioner may be unavailable when baby decides to show up, so your point #6 over arches the others. My birth was pitocin induced, with an epidural, delivered by an OB, and the thing I look back on with the most certainty and gratitude was the work of my OB himself. He was sensitive and reassuring and had great reasoning for all of his choices (it felt so good to trust him with those!). He made me feel valued and capable and treated my newborn son as the miracle he was– not just the product of another day on the job. Even though my experience of birth was so positive, I have sometimes felt lacking when I compare my experience to those who have natural births, as though there is more virtue in that. Thanks for your reminder that it is all about how I respond to what God gives me. I can trust Him so much more than myself or even a stellar practitioner! What a beautiful post. To me, being able to have a child is the beautiful part. After having a natural birth followed by 5 c-sections (babies 2 and 3 were both breech- which made all the rest of my deliveries cesareans), I don't think the way we deliver is more important than the fact we can deliver! Besides, delivery is just the beginning. Motherhood, by whatever means you achieve it, is the greatest of it all. Amanda, you can't say you would have killed your mother and yourself if you weren't in a hospital JUST because you were breech. Doctors used to deliver breech babies vaginally at home. I had a friend who had a breech baby delivered at home by an old GP who had been doing it for years. (late 70's,she-the GP- had been practicing for 30-40 years) The Farm midwives (google Ina May Gaskin) have delivered breech babies at home. Of course there are more things which can go wrong with a breech birth. But only a breech in which the baby has his legs crossed in a yoga position always causes difficulty, and even so, doctors used to go in and gently unhook the legs and bring them down one by one. I think you are assuming that "at home" means without medical attendance, and you are assuming the worst case scenario for breech. I also know someone who had a footling breech, first baby, delivered vaginally in the hospital by an experienced older OB. (maybe around 1978-79.) Certainly many breech babies could be delivered vaginally in the hospital but they are not, because there is a higher rate of possible complications than with head first birth, and legally no one dares to take that risk. This is far from saying a breech baby would kill its mother just because of the fact that it was breech! With very rare exceptions, one never knows "what would have happened if" birth had occurred in another setting or if no interventions or if different interventions had occurred. Someone said that finding out as much as you can isn't as much as you think it is. True. But by the time I had my first home birth with my fourth baby, I had read every popular book about birth which was available at that time,taken two Lamaze classes and a Bradley class, had attended two childbirth conferences and read their proceedings, and had studied a midwifery textbook and several OB textbooks. In fact I had an OB textbook from the 1700's, two from the 1800's, and three or four from the 1900's about 20 years apart. I studied the history of attitudes towards the epidural, and the development of the safe C section. I had memorized and gone over in my mind the maneuvers for unsticking stuck shoulders, since my big babies had big shoulders. I later used one of these when my daughter had her fourth at home. I will say that the first time I helped a friend have her baby at home; her eighth, I was acutely aware that my book knowledge was not the same as experience. It didn't turn out to be as easy as some of her earlier births. I was scared, and I prayed a lot. That child is in college now, by the way. Nevertheless, the more people know the better, so long as having some knowledge doesn't make them think they know everything. At least knowing something enables one to ask questions, and if one is not happy with the way those questions are answered or not answered, one ought to switch doctors or midwives. Why do you recommend [this procedure/medication]? What will happen if we don't do this, or what could happen? How likely is that to happen? How much time is there for us to decide? If time…What has happened in this situation in your experience…are there any studies…? Just some thoughts about possible questions. If you have done some reading you will understand the answers and perhaps know some follow up questions to ask. This is perfect timing. I had my first right around when your 4th was born – 3/3/09. And we just found out we're pregnant again. Yikes. I started looking into VBACs after my first became a c-section and I've been so devastated to learn I can't have one due to them being less than 18 months apart. This post helped remind me that God is in control, not me, and another c-section is fine – I'm just grateful for this little life growing inside. I had my first VBAC 17 months after my C section. And then I had seven more babies vaginally! And I had my doctor feel my scar from the inside after each birth and it never stretched out or separated or weakened in any way. God is not the one who made the 18 month rule! You are in control of whether you stop after hearing one doctor tell you that, or if you first, do some reasearch and find out what that rule is based on. Is it based on studies or is it just a gestimate? If on studies, how were they conducted? On what population? For instance, the studies justifying my first C section, related to infection rates after 24 hours of ruptured membranes, were done on women on public assistance in a big inner city hospital, who were having many vaginal exams by residents. It turns out that the infection rate soars 24 hours after the first vaginal exam, not after the actual rupture of the membranes. And on the whole these women would have been less well nourished and had more unhealthy habits. There are all kinds of confounding factors in studies. Have you heard of ICAN, the International Cesarian Awareness Network? Have you read the book The Silent Knife, about the C section epidemic? Please don't give up. If you are healthy and eat well and take vitamins your uterus is most likely in great shape. Unless there is some specific medical reason related to you in particular. Research the subject, and then try a few different doctors at least. Because of insurance companies you have to have a VBAC in a hospital that has an anaesthetist and neonatologist on staff at all time, which means a big one. If all of that is in place, you may well find a doctor who won't insist on the 18 month rule as an absolute. I think I went to 5 doctors in Annapolis before I found one in DC who would do a VBAC, back in 1974 when almost no doctor would do them. For a while they became very common, and then insurance companies made it very difficult for doctors to do them and they became less common again. Very little about birth is an absolute. But ahead of time, it certainly isn't against God's will for you to question whether this or that rule or policy about birth is really 'research based' and valid, or not. That is perfect that people are able to get the business loans and that opens completely new possibilities. Very interesting! So nice to hear from someone who can relate. I’d never heard that Lovenox is safe for laboring women. My impression was that it could make some emergency procedures (e.g. C-sections) more risky and/or complicated, but I haven’t researched it thoroughly. 1) I’m homozygous for Factor II, meaning I have both copies of the gene. They know that that makes my condition worse, but they don’t know how much worse because it’s so rare it can’t be studied. I think they wanted to be extra cautious with my labors because of this unknown factor. 2) There was still quite a lot of the DVT left in my vein after I finished with Coumadin, that will always be there. It occurred at a sort of “fork in the road” in the vein, and a lot of it got stuck on the corner. I saw the ultrasound, and that part of the vein is significantly smaller now. Given that, plus the homozygous issue, they think there’s a pretty high risk for recurrence, and I’m on a high dose of Lovenox. Maybe that’s why the doctors and midwives didn’t think Lovenox was safe for labor? Oops! I’m so sorry I misspelled your name! That’s what I get for typing while distracted.